Description: Fruit body: 2.5 to 7 cm across, 3 to 9 cm high, elongated globe to pear shaped, white when young, later tan to olive-brown, at first covered with whitish spines that fall off when mature leaving minute scars on the surface; skin: dry, soft, with hole on top for spore dispersal when mature; spores: olive-brown. Habitat: Solitary, scattered, gregarious, to clustered on ground; widespread fall and winter. Primary keys: Upside down pear shape; white and uniform throughout; soft spines. Edibility: Good. A mild but interesting earthy taste. Notes: Formerly known as Lycoperdon gemmatum, this mushroom is extremely widespread and prolific, but it is edible only when young. When harvesting puffballs, cut every one in half vertically to make sure that 1) there are no outlines of immature gills or a stem, 2) the interior is uniform, marshmallow soft and pure white – not another color or maturing yellow to olive-green, 3) the skin is soft not tough. A poisonous Amanita button cut in half will show faint outlines of gills and a stem, and non-white puffballs may be toxic. Poisonous Scleroderma start white inside but turn black and have tough skin. “Lyco” means “wolf” and “perdon” means “to break wind” in Greek, so the two combine to mean “wolf-fart”. 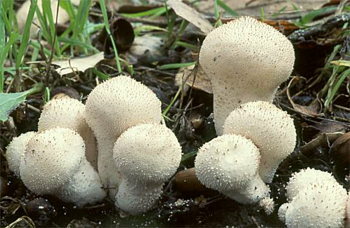 Puffballs can be dehydrated and powdered for flavoring bland foods. Cook the potatoes in salted water until almost done, 8-10 minutes. Drain, rinse with cold water and set on a towel to dry. Heat the oil and butter in a large skillet over medium high heat. Add the potatoes and mushrooms, reduce heat to medium and cook until potatoes are lightly browned. Add the shallot, rosemary, salt and pepper and cook another few minutes until shallot is tender. Remove from heat, toss with cheese, and serve immediately.